Is there a famous person or a teacher or maybe someone you've met in your life for which you have so much respect and admiration? Perhaps you've learned something from them, or wish you could be more like them in some way? It could be someone related to your work or an inspiring figure or leader that you've never met. Maybe someone you follow on social media and apply lessons you learn from them to your own life. When I was growing up many of my friends had someone like this, often an professional athlete or sports player, famous pop singer or actor, or a teacher of one of their childhood hobbies or passions. They followed them in their training, competitions, concerts, or in the news. They looked up to them, appreciated their talent and dedication, and they loved everything they said and did. They were fans and followers. For some reason, I never really had someone in my life or in my mind that fit into this category. Questions like 'who is your favorite pop singer', or 'who is your favorite soccer player' or 'favorite actor' etc, were always challenging questions for me. I didn't have favorites and I didn't have people who I followed in this way. There were no posters on my bedroom wall of soccer players, Olympic athletes, or pop stars! I often wondered why I didn't have this same urge to be a fan. In recent years, however, I have found myself becoming incredibly inspired by all the amazing yoga teachers and wellness practitioners from whom I've learned. I've felt more grateful and energized by these people than ever before, almost as if I want to be more like them, or manifest some of their attributes or energy within myself. Perhaps I'm feeling this way now because I have found something that I'm deeply passionate about and that feels more meaningful and purposeful than anything has before, and with which I feel a strong connection. It feels almost like I've found the path that I've been looking for all these years and didn't know. The path of infinite learnings and of infinite potential. I soak up all the teachings and still want more. I had no idea this path would be the practice of Yoga. My very first yoga teacher in my very first yoga class, in NYC in 2001 at the NY Sports Club was an amazing lady in her 60s. She was strong, flexible, and focused and was teaching a Power Yoga class. That's the first time in my life that I thought 'Wow, this woman is incredible. I want to be her and create this environment to allow other people to feel like I now feel'. Even though I could not have explained how I felt or what just happened. I just knew there had been a shift and I didn't just want more, I wanted to share it with others, and be like this amazing woman. The next person I remember feeling this connection with, as if I wanted to be like her, was my Chi Running instructor, Bryn Randolph. Bryn came into my life like a breath of fresh air. She taught me a private Chi Running class at a time when I was in pain, physically and emotionally. I felt more alive during and after that class than I'd felt in years. What she taught and helped me with changed my life and allowed me to run pain-free from them on, after struggling with knee pain for the past 3 years. Bryn was fit, healthy, happy, joyful and fun, and she was helping me and others to feel fantastic. What more could we want from life, than to share this positive energy with others. I wanted a taste of that energy, light and joy that I saw in Bryn's eyes and I knew I would be just like her one day. Since deepening my yoga and running practices, and learning from many teachers over the years, there are now many people I admire and follow, too many to mention in this one article, but I will mention a few, in no particular order. Dharma Mittra, Rod Stryker, Joan Hyman, Matt Giordano, Vidya Heisel, Jason Crandell, Stephanie Snyder, Deborah Lee, Ann Kyshynska, Bryn Randophn, Erika White, Brandon Raynor, and Danny Dreyer. It is thanks to these inspiring teachers and leaders that I have become the teacher, healer and leader that I am today. I am also now a fan. As much as I would love to share wisdom and teachings from each of these inspiring teachers, the purpose of this article is to share with you 3 simple yoga tips for mastering the yoga handstand and arm balances that I learned from one particular inspiring yogi, Matt Giordano. 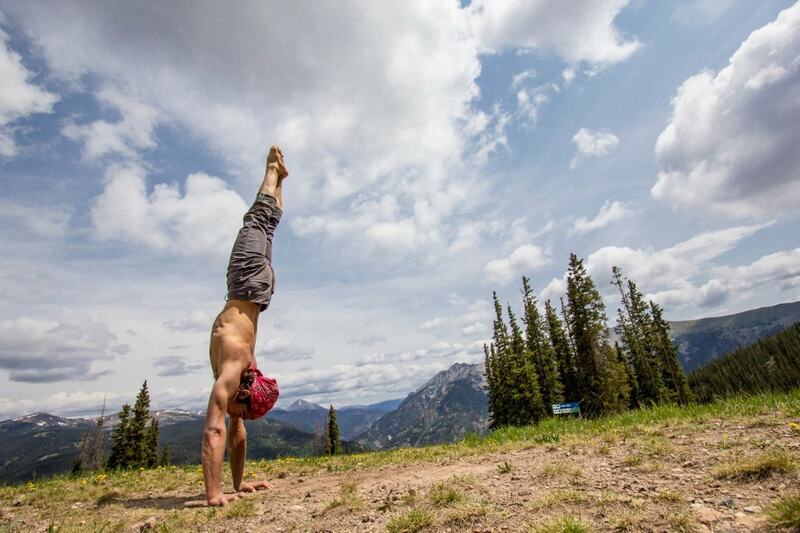 The main photo above is Matt in a perfect handstand, demonstrating incredible strength, focus and balance. I first met Matt at Wanderlust Squaw Valley Yoga Festival in July 2015, when I took two of his classes. I learned so much during his classes and felt such shifts in my practice that I've been following him ever since. I went back to Wanderlust Squaw Valley in 2016 to soak up his wisdom and teachings again. If you haven't experienced Matt's teachings or watched his yoga practice before, I encourage you to check out this fanatastic video below, and also follow him on Instagram or Facebook where he posts amazing videos, photos and inspirations. He moves his body mindfully and gracefully and with the utmost strength, control and focus. Matt has the ability to hold some of the most amazing handstand and arm balance variations that I have ever seen seen. I hope you will be as inspired as I am, and maybe also become a fan. 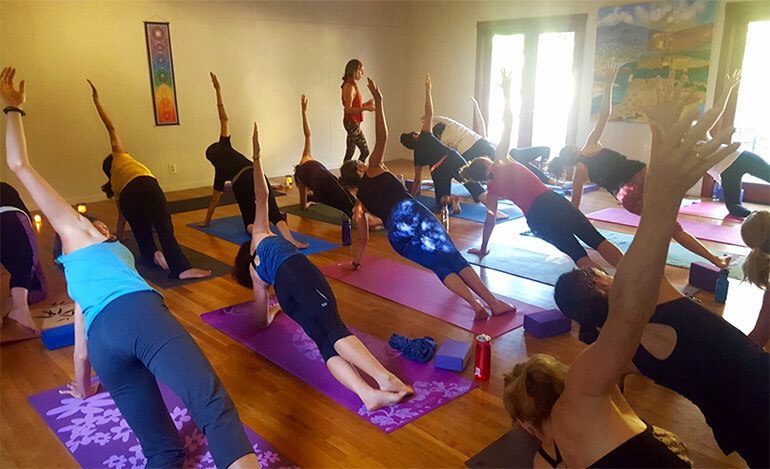 During the first class I took with Matt, I learned more tips for mastering these advanced yoga inversions and arm balances than I had learned in the previous two years. I have so much gratitude for these learnings that I want to share them with you. I had those 'ah-ha' moments where a few simple tips gave me a taste of what it feels like to find the strength, inner focus and that moment of perfect stillness and ease that is required to master these challenging poses. I still have a way to go before I master them completely. That said, the goal is to enjoy the journey and each step along the way. These tips have helped me to do just that. Before I share with you his tips, here's a short 3 minute video of Matt that demonstrates his strength, focus, precision and control, while also being a beautiful creation of movement, flow, music, and stillness. Are you now ready to learn how Matt holds these incredible poses so easily and with such grace and balance? Rotate the hands outward slightly so your first finger points forward and your elbow points back, instead of your middle finger pointing forward, which is more common in downward dog, chattaranga and plank pose. This will help to engage the triceps and allow the shoulders to be in a stable and strong position for holding your body weight. Round your upper back by pressing and drawing the ribs up and back towards the spine, kind of like doing a crunch. This keeps the core engaged and a strong torso. Use your fingertips as brakes by pulling the fingertips back to prevent you from falling forwards once you are in the pose, or moving towards the pose. There you go. Those are the 3 tips that transformed my handstands and arm balances. Simple, right? Obviously, there is a lot more to mastering handstand and arm balance poses. Wherever you are on your journey, even if you are just starting out, I encourage you to keep these 3 tips in mind, and your journey will not only be more focused and fun, but also safer as you'll be protecting your joints. Just like anything, it takes practice, patience, and commitment. Feel free to share any additional tips or questions you have in the comments section below. We'd love to hear from you! Please also share this article with your friends and followers if you found it helpful, by clicking the buttons below. Do you experience lower back pain? Perhaps if you spend a lot of time sitting down or driving?